Hi Everyone. Time for a new challenge over at the Glitter 'n' Sparkle Challenge Blog. We have a wonderful prize for you from our Sponsor Arti Doodles who are offering 4 Images from Store. 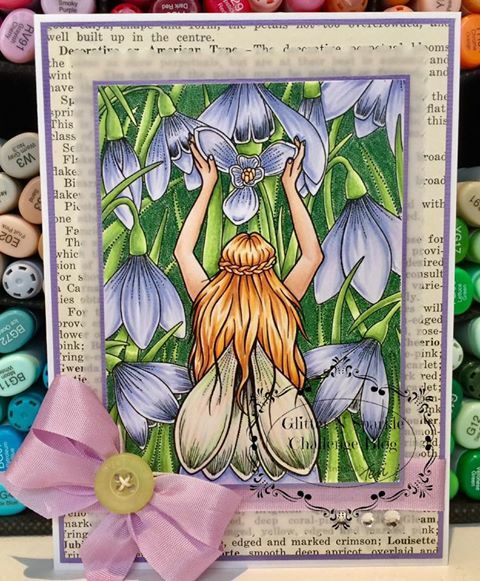 For my card this week I chose to play with a gorgeous image from Arti Doodles - Snowdrop Fairy. She is coloured with copic markers - colouring the snowdrops purple - yes I know snowdrops are white but I liked them in purple for our pastel theme! The background behind the flowers is simply coloured with green pencil. I have then picked some old text paper from a very old gardening book to use as my patterned paper - I really liked how it looked.